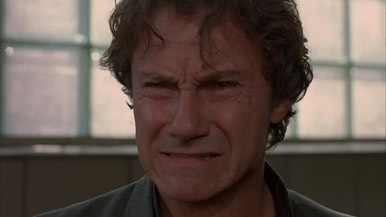 The great thing about a Harvey Keitel movie is Harvey Keitel. The not so great thing is the fact that there aren't enough of them. The man works with an offbeat set of tools - a pugilist's looks and the vocal palette of a constipated mental patient equal not-so-obvious leading man material. That is, unless it's 1992 and you're filming a story about a junkie cop on a downward spiral into oblivion. When Nick Nolte wants too much money and Mickey Rourke is too busy getting punched in the face to call you back, Keitel is your man. And when you're Abel Ferrara, and your previous directorial effort is King of New York, there really is no other choice. But where King of New York is self-indulgent and smug, Bad Lieutenant is raw and painful, like an open wound that you know will never heal. Ferrara and screenwriter Zoe Lund (whose own demons would claim her some years later) craft a viciously psychotic and symbolic look at a man best described as a turd circling the bowl - and it is only due to Keitel's spellbinding performance that it transcends its protagonist. If you can call him that. The eponymous Lieutenant begins the film setting a bad example for his kids, teaching them to solve problems with profanity and violence as he drops them off at school. Then, he semi-discreetly sniffs coke off the back of his hand in the crosswalk before driving away. But homicide is a tough job, right? Nothing jump starts your day like a little fist bump, right? The Lieutenant also runs the department betting pool, encouraging his peers to make risky bets, and then using their money to wager against them. Dishonest. Yes. Potentially critical plot point? You tell me. The Lieutenant's drug intake is so legendary that his dealer is mildly surprised to see him alive every week. He drinks so much that when he hires hookers to entertain him, he has to quietly hang out and drool on himself, because the little Admiral just won't salute. He treats crime scenes like his own personal Sam's Club, stealing evidence and putting it up his nose whenever possible. He makes arbitrary traffic stops on pretty girls so he can choke his chicken all over the side of the car. When this is how your character arc BEGINS, rest assured it’s only going to go downhill from there. And it does. The story runs parallel to a (I assume) fictional seven game series between the Dodgers and the Mets, with the Mets down three games. The Lieutenant is convinced the Dodgers will eventually win, so as I mentioned, he encourages his men to bet one way while he bets the other. Of course, the bets start going south, and the debt starts piling up. And so do the lies, when his friends come looking to get paid. Instead of getting out while he’s ahead, the Lieutenant continues to double down, insistent the Dodgers cannot continue to win. Even though I don’t follow baseball, I know it makes no sense to bet on the Mets - but neither does smoking crack at two in the afternoon, so in that context it’s completely understandable. In a pivotal turn of events, the Lieutenant is assigned to investigate the brutal assault of a nun - and by investigate I mean “get hammered and pass out at the crime scene.” A holy relic was stolen during the attack, and the Church is offering a $50,000 reward. Based on what we’ve covered so far, you can probably guess who is more interested in the cash than the dignity of the world’s largest religious institution. The Lieutenant desperately tries to convince the nun to identify her attackers - less because he wants to help her, but rather because he needs the money. Like watching an especially messy science experiment develop, you find yourself repulsed AND curious as the Lieutenant is first puzzled and then moved by the nun’s compassion for her attackers. At times, he almost forgets his financial desperation and longs for that same forgiveness in his own life. Needless to say, Bad Lieutenant is a morality play, although it’s a particularly inelegant one. Like most morality plays, the story takes place in a self-contained alternate universe where normal cause and effect seem to HAVE no effect. Over the course of the movie, we see this man ingest every drug known to man, drink himself to sleep and wake up in strange places covered with bodily fluids on a regular basis. And yet not once do we see him take a bath. How is anyone willing to talk to him? Isn't he working on a case? Doesn't he have superiors to report to? This guy never stops using long enough NOT to smell like the elephant pit at the zoo. It's hard to believe this guy ever became a cop, let alone remain one long enough to make Lieutenant. No, that’s not really the point, but it does periodically stretch the bounds of credibility. Still, as the Lieutenant falls into darkness he - and we - begin to realize that like most addicts, he doesn’t want to live this way, but he can’t find a way out. “Vampires are lucky, they can feed on others”, his heroin pusher advises him. And she’s right - addicts consume themselves, and as the clock ticks down to game seven, the Lieutenant becomes obsessed with making up his bets, self-medicating his pain and dodging responsibility for his actions. And despite all the effort, this is a guy who would seem to want to die, but doesn't have the guts to do it himself. Think of him as Popeye Doyle without a partner to reel him in. A character arc like this signals an eventual redemption tale, but for someone this despicable, salvation is going to be as painful to experience as it is to watch. Bad Lieutenant IS painful to watch - it’s grim, bleak and disgusting, much like the life of a junkie. And at the end, when the last piece of the puzzle gets snapped into place, it seems to fit - and in an equally bleak way, it’s satisfying.